Are Maintenance Guidelines a Good Idea? Due to federal law, child support standards are mandatory, and all 50 states have adopted some version. Although issues occasionally arise regarding their application in certain cases, by and large, they are successful in resolving child support by simply plugging numbers into a formula. Could similar standards work for spousal support? On Jan. 1, 2015, an Illinois statute for maintenance guidelines went into effect. Like child support, they are not mandatory guidelines, but rather, presumptive. Therefore, they serve as a type of default – they dictate the result if no action is taken to override them. While a court can override the default, it must explain the reasons for deviation. The length of maintenance under the new Illinois guidelines, depend, not surprisingly, on the length of the marriage. For a marriage of five years, for example, maintenance would be awarded for 20 percent of the length of the marriage, or one year. On the other end of the spectrum, maintenance could be equal to the length of the marriage – or even be indefinite – for a couple that has been married 20 years or more. The amount of maintenance under the guidelines is dependent, of course, on the income of the parties. Maintenance is supposed to equal 30 percent of the payor’s gross income minus 20 percent of the payee’s gross income, but not to exceed 40 percent of the parties’ combined gross income when added to the payee’s gross. In my opinion, they are if they allow for judicial discretion – in other words, if they are guidelines instead of standards. Guidelines are advisory; standards are (more or less) mandatory. The Illinois law seems to be more along the lines of standards than guidelines. The reason for standards is to even out differences between individual judges. There is no reason an individual should pay more or less maintenance – or receive more or less maintenance – because they drew the short straw (or long straw) due to their judicial assignment. Then again, circumstances in individual cases can be so variable that handcuffing judicial discretion can result in a lot of round pegs being forced into square holes. For one example, while a 20-year marriage sounds like a long one, it makes a significant difference if the parties were 18 years old when they got married as opposed to 38 years old. In the former case, the support recipient has a long time to develop job skills to become self- supporting. Not so much in the latter case. The last session of the legislature considered several versions, but adopted none of them. 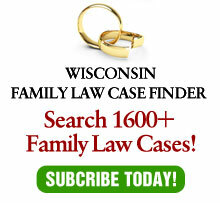 While anytime the legislature gets involved in family law issues is scary as it brings various interest groups, like divorced dads, out of the woodwork, some guidelines might be helpful to essentially codify current practice. For example, it is very rare to have maintenance awarded in marriages under five years in length, and when it is awarded, it is “soft landing” support, which is for a very short period of time. On the other end of the spectrum, for most marriages over 20 years – and almost all over 25 years – it is rare for a limit to be set. Typically, these are indefinite maintenance orders. In the same vein, the longer the marriage, the more likely the court is to equalize net disposable income. While codifying the above would do no harm, it is critical that the court always has discretion to disregard the guidelines and make an order reflecting the circumstances of each individual case. Providing general guidelines so people have an idea of the general parameters is fine. Using a straitjacket and ignoring individual circumstances would create more harm than good. This article originally appeared in InsideTrack, a bi-weekly newsletter published by the State Bar of Wisconsin.